The Ha'penny Bridge in Dublin city. DUBLIN HAS REENTERED the top 10 most liveable cities for Europeans, according to a global survey. Copenhagen in Denmark and Bern in Switzerland rank joint first in the survey, while The Hague in the Netherlands and Geneva in Switzerland are joint third. Stavanger in Norway rounds out the top five. Dublin ranks joint ninth in the survey, up from 11th place last year, due to improved scores in infrastructure and personal safety. Cities around the world are evaluated annually by ECA International on a variety of factors such as availability of health services; housing and utilities; isolation; access to a social network and leisure facilities; infrastructure; climate; personal safety; political tensions and air quality. The Irish capital shares ninth place with Gothenburg in Sweden and Luxembourg. Dublin was previously in the top 10 in 2016, when it also ranked ninth. “Dublin improved in personal safety this year due to greater security at night – more policing, safer streets and better lighting according to the feedback from European expats. 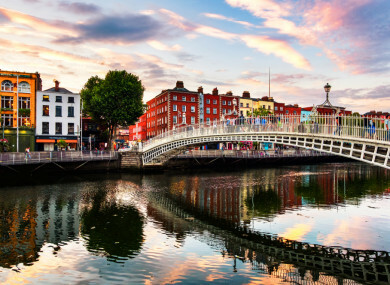 “Dublin also scores well due to the fact that healthcare is widely available and easy to gain access to for expats,” an ECA spokesperson told TheJournal.ie. The survey measures the quality of expatriate living conditions in over 480 locations around the world and assesses the level of difficulty the expatriate will experience in adapting to a new location. Edinburgh is the only UK city to rank in the top 20, in joint 19th place with Stockholm. Cardiff ranks in joint 24th place with Antwerp and Frankfurt, and Belfast and London are in joint 49th place. Dublin also came in at 23rd place for Asians expats, beating many Asian locations including Hong Kong, which is 41st. ECA said Dublin has “a strong international expat community” but dropped out of the top 10 in 2017 “due to a shortage of suitable housing for expatriates in the city”. Cities in northern European and Scandinavian nations dominate the top 10 most liveable locations for European expats. “Cities in Scandinavia, Switzerland and the Netherlands have offered good liveability across the board for many years now; with factors such as excellent infrastructure, reliable transport systems, and a high level of healthcare all contributing to their consistently excellent liveability score,” Neil Ashman, senior analyst at ECA, said. The most liveable non-European location for European expats is Toronto, Canada. Canadian cities in general all score well in the survey, with Toronto, Vancouver, Ottawa and Montreal all scoring higher than Belfast, London and Glasgow. Canadian cities have always featured high up in the rankings for European expatriates thanks to low crime levels, good public facilities, and little air pollution. “The only anomaly to this was in 2017 when Montreal briefly dropped in the rankings following severe flooding. The city has since recovered well since the floods and risen five places in the latest survey, essentially returning to its original position,” Ashman said. Canberra in Australia and Wellington in New Zealand also offer high liveability standards for Europeans, making 40th and 45th place respectively. All of the Australian and New Zealand locations included in the rankings feature in the top 100. Ashman said this is due to low crime rates, efficient transport services and a range of available housing. “Asian cities tend not to feature so highly for European expats due to significant differences in climate and language. “However, a number of factors make Singapore the most liveable Asian location for European expats including the large European expat communities already living in Singapore – something which makes it a lot easier for expats to adapt and suitably acclimatise to their new surroundings,” Ashman said. Email “Dublin enters top 10 most liveable cities for Europeans”. Feedback on “Dublin enters top 10 most liveable cities for Europeans”.